The amounts of coal deposited on the wharfs of the W & B are mentioned in L J Dalby's book, 'The Wilts & Berks Canal', in order to give some indication of the relative importance of the wharfs. 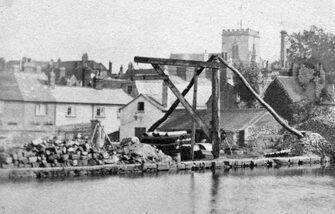 In 1838, for instance, the figures for those at the Berkshire end of the waterway were: Shrivenham 546 tons, Longcot 2,804 tons, Uffington 546 tons, Challow 1,668 tons, Wantage 1,885 tons and Abingdon 9,930 tons. By about 1895 the Somerset Coalfield was worked out and the main reason for the existence of the W & B was gone. In the Spring of 1897 the canal owners made application to the Board of Trade for a warrant authorising abandonment of the W & B 'on the grounds that the canal is unnecessary for the purposes of public navigation'. The company also asked for an order releasing it from all liability to maintain the canal if the warrant was issued.